Iâ€™ve just sent out the December 2011 Capital Drain newsletter.Â If youâ€™re on the direct mailing list for that, you should be receiving it now. If youâ€™re not yet on the list, but would like to be, send me an email. If you just want to read the letter, follow this link:Â December 2011 CapDrain. I hope youâ€™ll enjoy it.Â You can sample from the past several years of newsletters on this page. Iâ€™ve just sent out the (Dec. 2011) Occupy Special Edition Capital Drain newsletter.Â If youâ€™re on the direct mailing list for that, you should be receiving it now. If you just want to read the letter, follow this link:Â (Dec 2011) OWS Special CapDrain. The US economy is still far from robust, but it is definitely recovering.Â Â This week brought more good news. Despite all the liquidity that the Federal Reserve and other Central Banks have created, inflation remains tame.Â Â If you’re a regular reader, you expected that.Â Inflation isn’t really caused by money supply, it’s caused by too much money chasing too few goods.Â Â We (the banks, anyway) have the money, but we could make plenty more goods if only we had buyers.Â Â No chasing means no inflation.Â Â At least we can enjoy the freedom of action that the low inflation creates. Employment growth has been positive but slow.Â The good news this week was that the Initial Unemployment Claim report was the lowest in years. 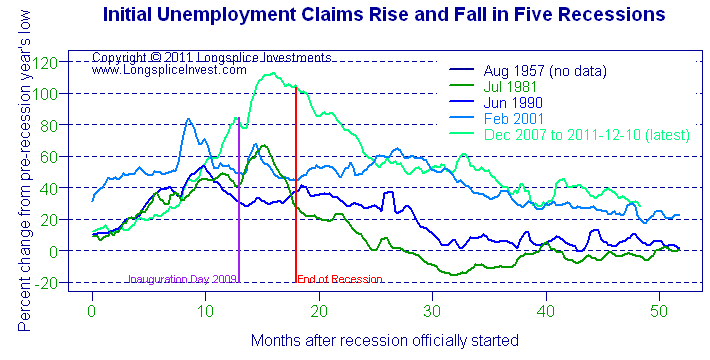 As fewer people lose their jobs, the new jobs being created have more net positive effect. 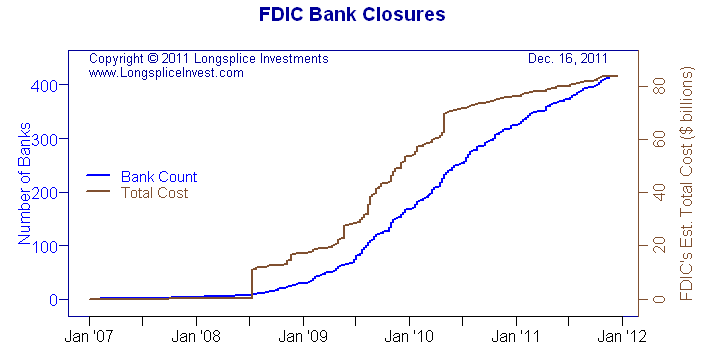 Going back to the bad debt crisis that started it all, improvements are even better.Â Â We went three weeks without the FDIC having to close any more failed banks, and today they closed two but they were small (<$40M each). This gives us the ingredients for a virtuous cycle:Â continued improvement in the economy means less stress on banks and fewer failures.Â Â Healthier banks means that they’ll start lending more to support new home buyers and business expansion. We have quite a ways to go, but we’re going the right way. A bunch of regular folks, and some who were irresponsible, borrowed money from banks. No one made the banks lend the money;Â the banks did it to make a profit.Â Â The banks even assumed that if the less-responsible borrowers got into trouble, then someone else could be coerced into paying the cost. Â In retrospect, that is moral hazard. The irresponsible borrower got to (really too far beyond) the limit, and had no real choice but default.Â Â The other borrowers shrugged at first, then learned from the banks that the banks would be ruined by the default, which would ruin all the other borrowers, and basically all the rest of the world for good measure.Â Â The banks told their governments that they needed to be ‘supported’ or some such euphemism for the good of the world economy. Â That sounds like the banks were too big to fail. Am I re-hashing the same old housing bubble?Â Â Oh, no, not at all. I’m talking this time about the Euro sovereign debt crisis. Â For all the talk about the future of united Europe and the common currency and Mediterranean profligacy, this is the same story again, centered on Greece. a) they didn’t want to take such a big loss, because it wasn’t really REALLY their fault, because they believed the Ratings Agencies, and the Agencies had said that Greek government debt was basically as sound as any other Eurozone debt. Oh, and b)Â if the banks had to write off the bad loans they’d freely made, they’d be insolvent.Â Â They would fail, bringing the EU’s economy down with them. Since those phone calls, all the talk of history and unification and ever-closer and whose responsibility was for what, or whatever, was all about protecting the banks from their own bad lending in order to protect the region’s (and possibly world’s) economy. Three years on from the US bad-debt meltdown, it appears that no one has learned much, unless you propose that the banks have learned that they’re invulnerable as long as they can fend off meaningful regulation. Â The banks still had extremely high loan:capital ratios, so they could maximize their profits at the oh-so-small cost of possibly holding the world hostage if their dodgy bets failed.Â Â The banks were still huge, so the threat of their failure taking down all of Europe was real. This time, could we actually have the reform that we knew was needed after last time?Â Â Please? No, probably not.Â Â The banks have a lot of clout with the politicians on both sides of the Atlantic.Â Â They will deny.Â Â They will distract. Â They will defend. Â They will delay. They won the first round, in the US. Â They appear to be winning the second round, in Europe. Â Can we get the electorates of these regions to put all their weight on the politicians, and get some reform? Â You may hope, but don’t blindly believe. You could, of course, fight.Â Â You know it’s worth it, but you’re busy. Â Maybe someone else will do it. Something to look forward to:Â Round 3 may be China.Â Â That will be extra fun, with even less transparency, less popular power, and an even murkier boundary between the bankers and the government. You are browsing ‘The rigger's log’ archive for December, 2011.